Appetizers are great for dinner and cocktail parties. They keep hungry guests happy, and they help soak up some of the booze early on. Here's an easy way to determine how many you need. At the Food Network Blog, celebrity chef Giada De Laurentiis shares a great rule of thumb when it comes to prepared party appetizers: plan on making or buying about four pieces per person. Obviously you can have other snacks like chips and dip to satisfy folks with the munchies, but for prepared appetizers like bacon-wrapped dates, this is a good average to keep in mind when you're buying ingredients at the store. Also, it never hurts to make a few extra! Im having a party on the 30th.... It stunned me, Ive never considered these. I may have to make some now!? 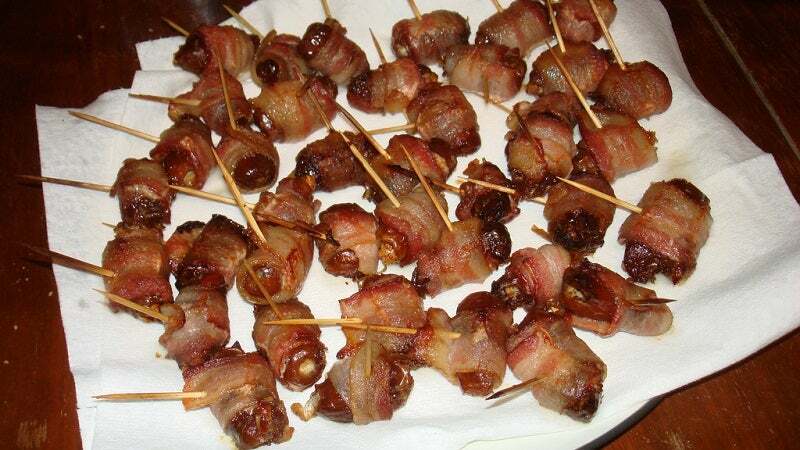 Devils on Horseback! a.k.a grilled bacon wrapped around a prune.